Lovingly restored, the Best Western Mercedes Arc de Triomphe fosters French tradition with the art of reception. 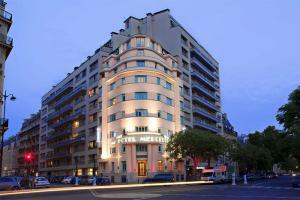 The hotel is located in the very heart of Paris, off the Avenue des Champs Elysees. A 24-hour front desk, express check-in/check-out and business center are among the noteworthy guest amenities. 37 rooms, enjoy 24-hour room service, air-conditioning, bidets, balconies, mini-bars, refrigerators, high-speed Internet access and more. Just like the thoughtful restoration, attentive staff fulfill guest requests with particular care. 17 miles from the Charles de Gaulle Airport. In the 17th arrondissement, near the Avenue des Champs Elysees and the Arc de Triomphe.